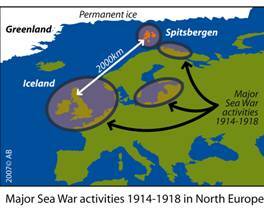 Can WWI have caused the Spitsbergen warming? WWI had destructive effects on men and on the environment, but nothing changed the commons of nature as much as the naval war did. This notion derives from understanding that the ocean, together with the sun, determine the status of the atmosphere on a short, medium or long term to such an extent that the word ‘climate’ would be given a meaningful sense if defined as: ‘Climate is the continuation of the oceans by other means’. another one which is not destructive to men, namely the changing of the common temperature and salinity structure of the seas, where naval activities have taken place. The second aspect is certainly not the only one, which might have had a significant impact on the interior of the seas in question, but it is, presumably, the most important one. Particularly sea surface layers of 50 metres depth and shallow seas (like the North Sea) are highly complex entities, always under permanent change due to season, wind, rain, river water, melt water, ice, and so on. The common sea structure changes according to whatever activity might take place in there: navigating, fighting, torpedoes, sea mines or any other military means. In North Europe, naval war lasted four years in the Baltic Sea, in the southern Barents Sea, in the whole North Sea, and in all the waters around Great Britain, including the Eastern North Atlantic and the West of Scotland, where warm Golf Current flows into the Norwegian Sea. Huge water masses were churned upside-down. The Norwegian Current transports these water masses northwards, to Spitsbergen. The temperature and salinity structure of the water had certainly changed their composition. How close was the naval war to Spitsbergen? Naval war during WWI was highly concentrated in the seas around Great Britain. No war ship ever came closer than 600 km to Spitsbergen, and those, which operated around the North Cap, up to Archangels, were not so numerous. The distance between Spitsbergen and the main naval battleground was of about 2000 km. But this distance is not very significant in this case. The currents moving along the Norwegian coast consist of water from the North Sea and of water from the Golf Current, flowing at a medium speed of 0,1 km/hour. At the sea surface, the current is up to 10 times faster. While the Atlantic branch current needs some time, presumably 1-3 years, to cover the distance between Scotland/Shetland Is. and Spitsbergen (ca. 1500km), the transport of surface water into the high North can be accomplished within few months. All mentioned timing illustrates perfectly the ‘connection’ between WWI and Spitsbergen warming, as it will be further explained in the following sections. When did naval war get in full swing? Although WWI started in August 1914, naval war began in earnest only two years later, in the autumn of 1916. In 1914, war parties were not well prepared for naval war. For example, the German Navy had 28 U-boats with a very limited capacity, which sank only 10 vessels of 20,000 tons until February 1915. Nine months later, Britain had lost almost one million-ship tonnage, respectively one ship per day. The situation had changed in 1916, when a series of new weapons were put in use: sea mines, depth charges, new sub-marines, and airplanes. By then naval warfare had reached a destruction stage to which no one might have thought only two years earlier. The situation became dramatic when U-boats destroyed more ships than Britain could build in early 1917. In the month of April 1917, the same total rate of the previous annual rate of 1916, ca. 850,000 tons, was destroyed by U-boats. 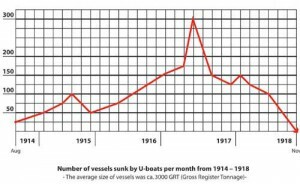 In April 1917, Britain and the Allies lost 10 vessels every day. 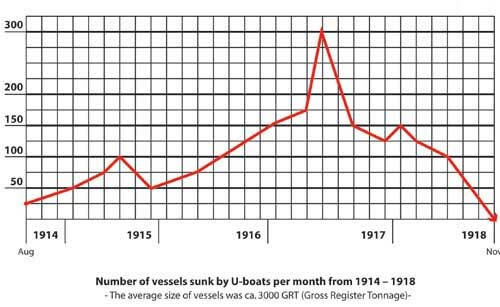 During the year of 1917, U-boats alone sank 6,200,000 tons, which means about 4000 ships, and, during the war months of 1918, another 2,500,000 ship tonnage. The total loss of the Allies ship tonnage during WWI is of about 12,000,000 tons, namely 5,200 vessels. The total loss of the Allies together with the Axis naval vessels (battle ships, cruisers, destroyers, sub-marines, and other naval ships) amounted to 650, respectively 1,200,000 tons. 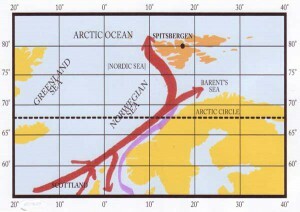 Since naval war got very serious, in late 1916, the seawater bodies around Great Britain needed only a short time period of a few months to 2 years to reach the Archipelago of Spitsbergen, making West Europe’s seas proverbial to the front garden of the Spitsbergen Archipelago, in the North. The weapon scenario employed since 1916 is too complex to make a full assessment. Many figures are even impossible to quantify. The air force, for example, went through a great development. Airplanes were increasingly used in bombing and attacking missions over the sea. But it would be a mere speculation to try to indicate the number of bombs that fell and exploded above or under the sea surface. We can say the same for the torpedoes activated, or for the depth charges dropped upon the submarines; there were certainly many ten thousands of them. More detailed information is available about the sea mines. Sea mines were planted massively in the water column as soon as they became available, in 1915. A total of about 200,000 sea mines had been deployed. Of much powerful effect in churning the sea on a huge scale were those ships known under the name of minesweepers, which navigated the seas day and night to find and destroy the mines. Britain alone had more than 700 operational minesweepers; the Germans came close, too. One particularly ‘effective’ undertaking on the interiors of the sea was the ‘Northern Barrage’. 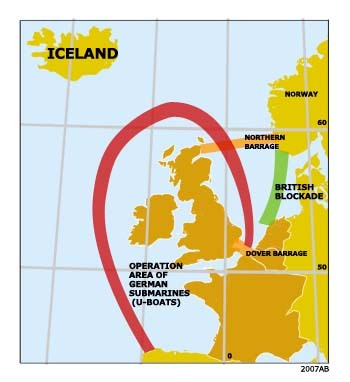 The USA and Britain set up a huge mine barrage of about 80,000 sea mines between the Orkney Islands and Norway, in order to prevent U-boats from leaving the North Sea and to torpedo merchant vessels which transported supplies to Britain, in the Atlantic. For this purpose, a new mine was developed after 1916 and deployed since March 1918 until October 1918. The mine with the name of MK6 consisted of 300 pounds of grade B trinitrotoluol (TNT), could be placed down to 240 feet below the sea surface. Many mines blew off prematurely. Others must have been drifted away or exploded during the storm season. During mine-seeding missions, it was observed that the mines exploding at a deep level caused a ‘circle of brown discoloured water spreading slowly around the vessel’. 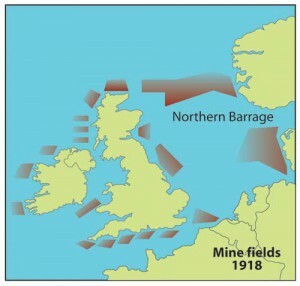 When the seas were swept with more than 80 vessels, since March 1919, only 20,000 mines had remained in place. War matters are usually quantified on the basis of costs and destruction caused to soldiers, population, buildings, industries, material, etc. Whether the water masses of a sea body have been turned up-side-down has never been of any interest. But that has happened on a grand scale. While in many cases seawater may have remained unchanged, temperature and salinity structure over a range of one metre to many dozen metres of surface water was always altered by any naval activity, whether there were weapons, sunken ships or mines planed or swept. Naval war at the magnitude of WWI means that many thousands of vessels navigated in defence-, combat-, or training missions, day and night. Battle ships had a draft of ten metres and could travel at a speed of 30 knots/hour (ca. 60 km/h). Although the sea surface may look the same before and after a battle ship had crossed it, previous temperature and salinity structure changes completely down to one to two dozen metres. The old status of the disturbed area will never be the same again, although a similar status will presumably come up after a couple of weeks, months or years. 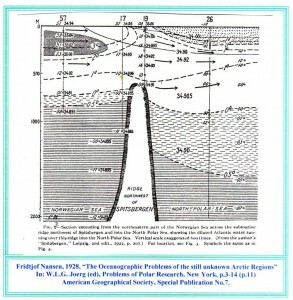 Any seawater alteration is not confined to the same location, because currents ‘transport’ it from one location to another, mixing it with different water bodies and currents and bringing it, finally, into the Polar region. In addition to sea body alterations caused by ship navigation and weaponry, the wide range of other impacts should at least be mentioned. Most ships, which were sunk, transported a variety of cargo, and all of them had equipment and provisions on board. The total number could be somewhere in the range of 10-15 millions tonnes. Not everything has an immediate or a long-term impact on the sea body structure, but many millions of tonnes must have had. A vessel loaded with cement that sank in shallow waters may be negligible; a vessel loaded with chemicals, which sank in the sensitive deep waters at the West of Scotland presumably, had a significant impact. It has been never quantified how much cargo and provisions surfaced and travelled with the currents towards the Arctic region and how the sea and sea-ice interacted with all that stuff. The naval war from1914-1918 can be considered as the most comprehensive single event, which has altered the common sea body structure around Great Britain through a huge variety of activities and means. 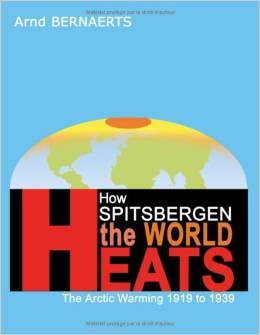 In previous chapters, we have demonstrated that an extraordinary warming phenomenon took place at Spitsbergen. These two events are strongly connected by the timing of each event and by the current system between the two locations. No other coincidence of such a close relation has ever been observed before or after WWI. The coincident is prima facieevidence that naval war has caused the warming. This investigation is not in the position to provide and analyse what physical processes of the oceanic interiors, at the sea surface or at the level of sea-ice have actually triggered the Spitsbergen warming. That is not possible even though the two events in discussion took place only almost one century ago. There are no observations or records on how naval war affected the sea body around Great Britain. There is no phenomenon comparable with the Spitsbergen event. Any discussion concerning physical processes in the water bodies in question would be nothing more than speculations. 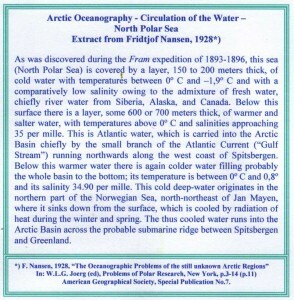 On the other hand, it seems not impossible to establish a full proof with further, in-depth research, if concentrating particularly on one important observation Schokalsky made in the 1930s, namely that the cover layer of cold water, which was measuring 200 metres in the 1890s, was reduced to less than 100 metres in the 1920s. An important number of reasons for the claimed thinning of the surface layer could have been generated in West Europe’s waters. 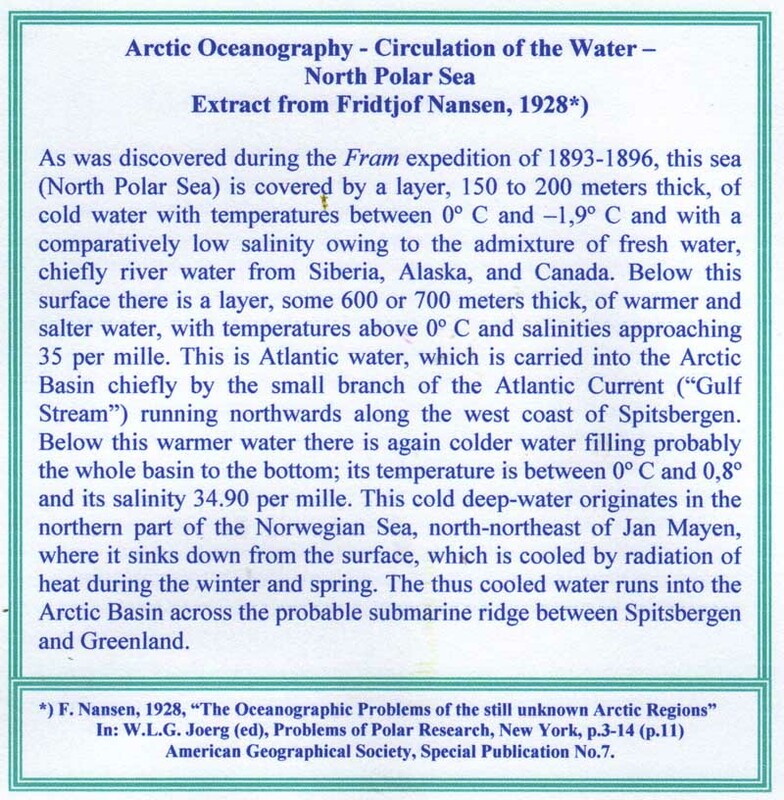 It is the task of the ocean scientific community to find out what has actually happened in the waters around Spitsbergen that increased the air temperatures dramatically during the winter season, in the winter of 1918/19. It seems time to put the notion aside that the Arctic warming remains “one of the most puzzling climate anomalies of the 20 th century”. The warming phenomenon discussed is not as puzzling as claimed. 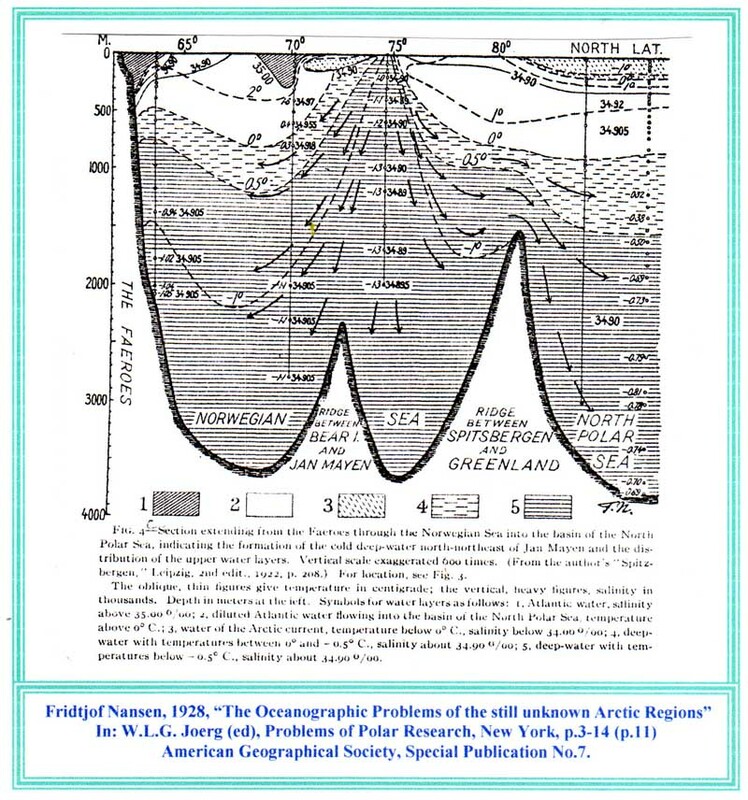 This investigation could establish that only the seas in the realm of Spitsbergen could have generated the sudden increase of the observed air-temperatures in winter 1918/19. The investigation could furthermore confine the time period of the events commencement to few months, namely the winter of 1918/19. This timing stands in extremely close relation with the naval war activities in Europe. The investigation could demonstrate that the geographical distant of ca. 2000 km is practially not existent. Due to the seawater current system all war torn or polluted seawater masses reach literally the front garden of the Spitsbergen region in a time span of a few months, or 1 to 3 years, which ‘in one way or the other way’ shifted parts of the ocean interior, causing increased heat release far above previous statistical mean. 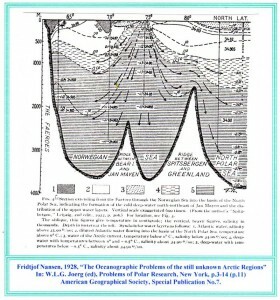 The author of this paper has suggested and discussed this matter in a number of publications since 1992, see ‘Previous Essays’,www.oceanclimate.de. The branch of the North Atlantic Current has temperatures exceeding 6°C and salinity greater than 35. Norwegian Coastal Current flows closer to the coast of Norway in the upper 50-100 m of the water column with lower temperatures than the Atlantic branch and low-salinity water, less than 34.8. The average speed of the coastal current is in the range of 0,7 to 1 km/hour, while the speed of the Atlantic water further off the coast is in the range of 0,7-2,2 km/hour, and even under north-east wind condition, the average speed is calculated with 1 km/h. Daniels, Josephus; No.4 – Publication, ‘The Northern Barrage –Taking up the mines’, Navy Department, Washington 1920, p.47, picture caption. Schokalsky, J.; ‚Recent Russian researches in the Arctic Sea and the in moun tains of Central Asia’, in: The Scottish Geographical Magazine, Vol. 52, No.2, March 1936, p. 73-84.